This is a list of cheeses from Poland. The history of cheesemaking in Poland reaches 5500 BC, when cheese similar to mozzarella was produced in Neolithic in Kujawy (north-central Poland). Bałtycki Polish brand of cheese. Bryndza Sheep milk cheese made in Poland, Slovakia and Ukraine. Recipes differ slightly across the countries. Bryndza Podhalańska Podhale region Polish variety of the soft cheese bryndza. It is prepared with sheep milk and has been registered in the European Union's Register of protected designations of origin and protected geographical indications on June 11, 2007 as a Protected Designation of Origin (PDO). Edamski Polish brand of cheese. Farmer cheese In Poland, farmer cheese is similar in consistency to cottage cheese. The cheese is formed into a loaf. It's sometimes referred to as "pot cheese." Gołka Similar to oscypek/oštiepok, but made with milk from cattle. Hauskyjza Foodstuff made of cottage cheese, caraway and other ingredients, which are mixed, put aside for a few days to acquire the characteristic sharp flavor and tacky consistency, and then warmed and fried. Koryciński Podlaskie Voivodeship in eastern Poland Hard yellow cheese made from cow's milk named after the town of Korycin. Królewski Northwestern Masovia Similar in taste and appearance to Swiss Emmental. 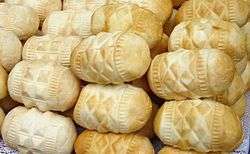 Oscypek Made exclusively in the Tatra Mountains region of Poland Smoked sheep milk cheese, there is also a smaller form called redykołka, known as the 'younger sister' of oscypek. Redykołka Produced in the Podhale region Sometimes known as the "younger sister" of the Oscypek cheese and the two are occsionally confused. The cheese is often made in the shape of animals, hearts, or decorative wreaths. Rokpol Polish blue cheese similar to Danish blue cheeses. 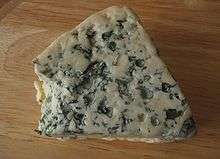 The name derives from Roquefort and suggests that it is Polish Roquefort. Twaróg Also known as Quark (cheese). 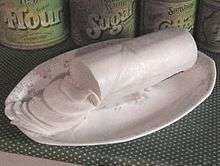 Pictured is Polish twaróg in the traditional wedge shape. Tylżycki Yellow cheese made from cow's milk, semi-hard cheese that is a variety of Tilsiter. ↑ "Najstarsze sery świata z Polski" portal Archeowieści. ↑ "Bałtycki ripening cheese". Osmozo.pl/. Retrieved 14 November 2013. ↑ "Cheese Description: Bryndza". Cheese.com. Retrieved 2008-06-11. ↑ European Commission (2007-06-11). "Commission Regulation (EC) No 642/2007 of 11 June 2007 registering a name in the Register of protected designations of origin and protected geographical indications Bryndza Podhalańska (PDO)". Retrieved 2008-06-10. ↑ "Bursztyn". Oldpoland.pl. Retrieved 14 November 2013. ↑ "Edamski cheese". Mleczarnia.lowicz.pl. Retrieved 14 November 2013. 1 2 Polish Cooking - Marianna Olszewska Heberle. p. 91. ↑ From a Polish Country House Kitchen: 90 Recipes for the Ultimate Comfort Food - Anne Applebaum, Danielle Crittenden. p. 239. ↑ "Codex International Individual Standard For Tilsiter"